Sie haben eine Frage zum Tigon Hostel? Egal ob Sie Urlaub machen oder geschäftlich unterwegs sind: Das Tigon Hostel ist eine großartige Wahl für Ihren Besuch von Hue. Die Unterkunft liegt nur 1.6 km vom Stadtzentrum entfernt und bietet Zugang zu den wichtigsten städtischen Einrichtungen. Aufgrund ihrer günstigen Lage bietet die Unterkunft den perfekten Ausgangspunkt zu den wichtigsten Attraktionen, die man gesehen haben muss. Das Tigon Hostel hat sich mit seinem herausragenden Service und einer breiten Palette an Einrichtungen dazu verpflichtet, Ihnen den Aufenthalt so komfortabel wie möglich zu machen. Die Unterkunft bietet zahlreiche Einrichtungen vor Ort, die selbst dem anspruchsvollsten Gast gerecht werden. Die Unterkunft "Tigon Hostel" verfügt über 35 Zimmer. Alle sind geschmackvoll eingerichtet und für höchsten Komfort mit WLAN, Ventilator, WLAN (kostenlos), Nichtraucherzimmer, Klimaanlage und weiteren Einrichtungen ausgestattet. Egal ob Sie ein Fitness-Liebhaber sind oder nach einem langen Tag einfach nur abschalten wollen: Die erstklassigen Freizeiteinrichtungen wie Spielzimmer usw. werden Ihnen gefallen. Aufgrund seiner sehr guten Lage und ausgezeichneter Einrichtungen trifft das Tigon Hostel in vielerlei Hinsicht die Anforderungen von Reisenden. Die Zimmer waren dreckig (schimmliger Duschvorhang, dreckige Bettwäsche). In der zweiten Nacht gab es einen Wasserrohrbruch im Badezimmer. Innerhalb von zwei Minuten War das Wasser auch überall im Zimmer. Für die Nacht haben wir ein anderes Zimmer bekommen, jedoch War dies auch sehr dreckig. Am nächsten morgen sollten wir die Nacht zahlen, obwohl all unsere Sachen nass geworden sind. Das Personal bzw der Manager wurde in dem Gespräch immer ausfallenden und ließ nicht mit sich verhandeln. Trotz der guten Lage würden wir dieses Hostel auf keinen Fall weiter empfehlen! We booked a private room with 2 twin beds. One mattress was fine but one was collapsed on one side (like the springs were bent or something). The room was clean - ish, all the important parts like the sheets and the floor and bathroom were clean but there were dead bugs on the walls near the ceiling and everything in the hotel just felt shabby. That being said it has great staff and a good location and the negatives weren't deal breakers for us. It was a nice stay as the hotel wasn't over crowded so I stayed in a room with just one more girl in a 4 bed room, so that was perfect! The aircon is perfect. The only downsized is that the common area need to improve as it looks old. The breakfast wasn't included and they don't offer bycicle tours anymore. If you want you have to find a group of minimum 5 pax. The bycicles are good as they are new, and the staff is very nice too. 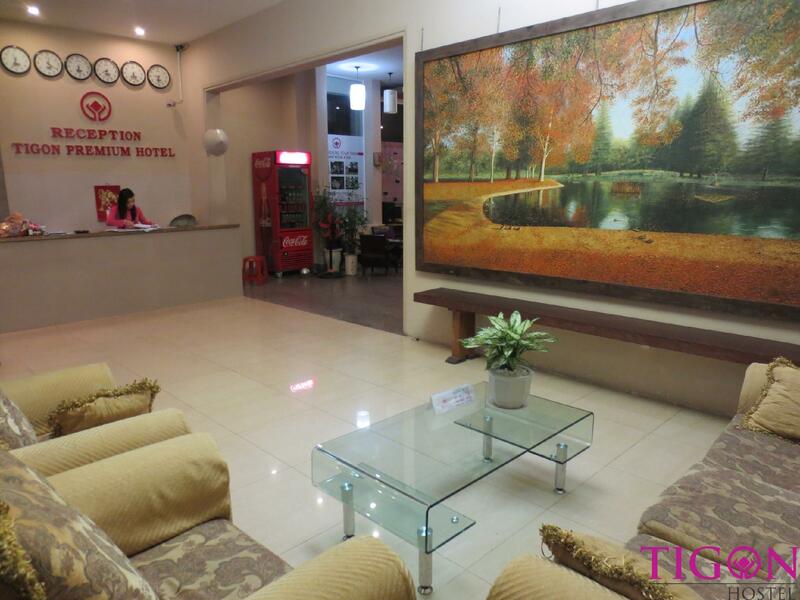 Originally I booked two nights at Tigon Hostel, but I only stayed one night and left early to go to Phong Nha instead. The hostel staff were disorganized from the beginning, when they couldn't find my reservation for two nights and then showing me to the room where they had me at the wrong bunk. While the rooms were large and spacious, the 10 bed dorm room was very dirty with a single bathroom to share. The lockers were small and the beds were squeaky metal frames that were not very strong. Downstairs there was a restaurant that was full of loud vietnamese in the morning that echoed up the stairways as early as 7 am in the morning. All of this led me to leave a day early and just head to my next destination. Stayed in the female dorm, nothing special. first of all the service was amazing. they go above and beyond to help you out. Secondly the breakfast was amazing. so much food for $2.00. Amazing. I had to go to the hospital for 4 days and they upgraded my friend from a dorm to a private room just because! And they have a bath, need I say more. Very clean hostel with a great lounge area. Pool table is great for bonding with friends and new travel buddies. Good food in house including a great breakfast (at extra $2 charge). Staff is also fantastic in helping you with your further travels. Cheers to the overnight guy who is very friendly. Thanks guys! 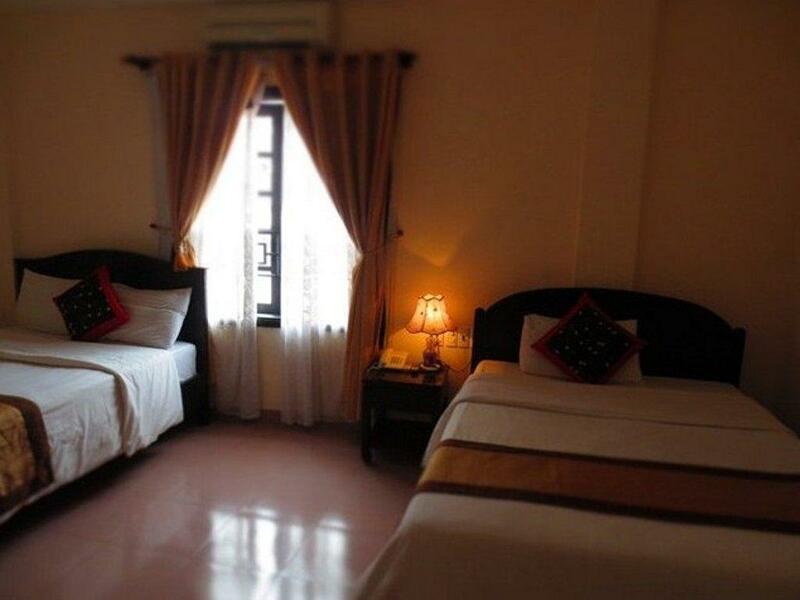 I booked this hostel the day I arrived in Hue and did not have high expectations. 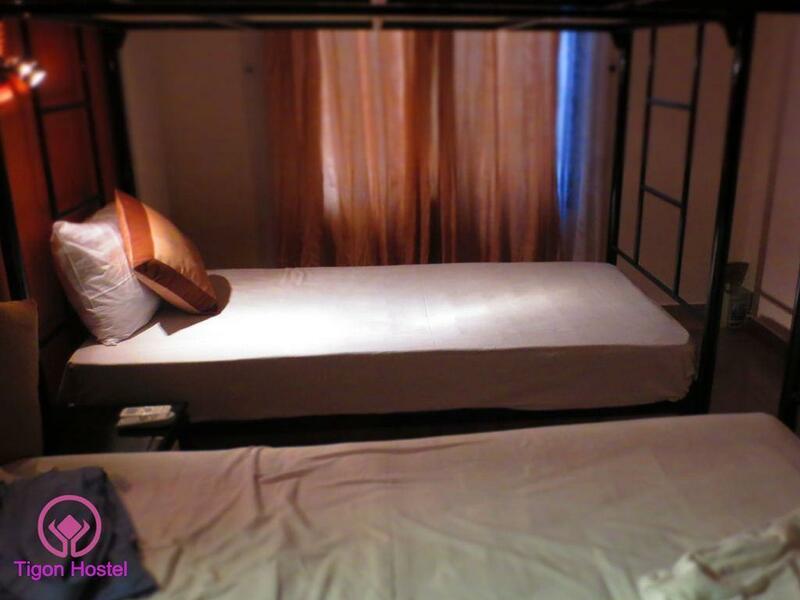 The hostel was nice and clean, and located near the Citadel, which was favorable for me. Lots of small shops and restaurants nearby. I have not tried the food at the restaurant inside the hostel, but the prices indicated in the menu seemed very reasonable. Staff was very friendly and helpful and they were willing to go the extra mile to help out guests. 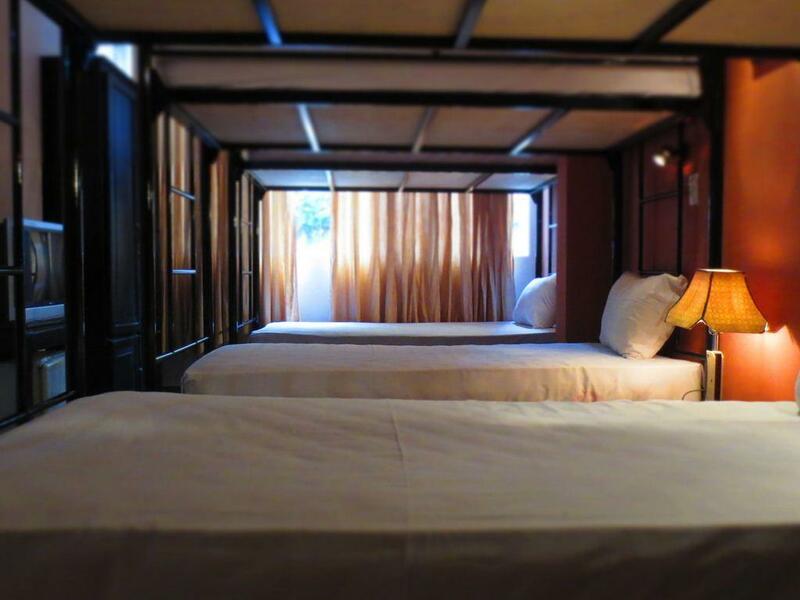 Overall, the hostel experience was very good for the price per night. Good location & price & really nice reception. Rooms smelly & musty, old fashioned place. Breakfast ok.
For a backpacker wanting to stay somewhere cheap this place is amazing feels like you are walking into a 4 star hotel by the entrance! Also hired biked through them and this was great as all. The staff were extremely helpful so this made the hotel better. Thats it. We stayed for two nights. The staff were excellent helping with laundry and booking a bus to hoi an. Apart from that it wasnt amazing. The shower was cold and a bit dirty, the wifi was terrible, a window had been wallpapered over and the door had cracks in it which made me worry about my stuff in the room. Its a basic and fine hotel in a good area just maybe not good for couples. The staff at tigon hostel were the friendliest girls I've come across in all of Southeast Asia. They showed me everything I needed to know about the city, rented me a bike, and made sure my stay was as comfortable as possible. I had a night train to Hanoi, and even though I had checked out they called me a taxi to the station and let me shower before leaving which was a godsend after sweating on my bike all day. The rooms are very homey, I slept like a baby in the comfortable bunk bed! Highly recommend this place just for the service, great for a budget traveler.